Luccombe Villa is an elegant stone-built Victorian property standing in large secluded gardens. It occupies a marvellous position just a couple of minutes walk from Appley Steps which lead down to Shanklin's sandy beaches and waterfront pubs. 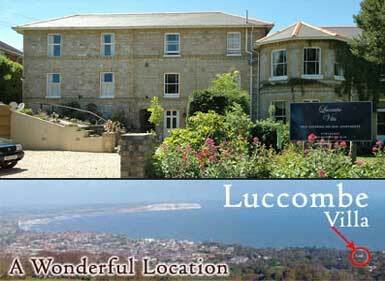 Luccombe Villa is also a short stroll from Shanklin Old Village, Shanklin Chine and the beautiful Rylstone Gardens. It lies on the Island's famous Coastal Path which you can follow to Bonchurch, Ventnor and, finally, to the south tip of the Island. There are nine self-contained holiday apartments at Luccombe Villa. Our spacious apartments vary in size from one to three bedrooms (many with en-suite facilities). They are comfortably furnished with FREE Wi-Fi internet access, TVs and DVD players. Kitchens are fully equipped with fridge, freezer, cooker and microwave. There is a separate laundry room and plenty of parking.